The below artworks are the most important by Roy Lichtenstein - that both overview the major creative periods, and highlight the greatest achievements by the artist. Artwork description & Analysis: Popeye was one of the very first Pop paintings that Lichtenstein created in the summer of 1961. At a later stage he would begin to focus on the generic human figures that appeared in cartoons of the period, but, early on, he chose immediately recognizable characters such as Mickey Mouse and Popeye (here, Popeye appears with his rival Bluto). The work is also distinct in being one of the last in which Lichtenstein actually signed his name on the surface of the picture; critic Michael Lobel has pointed out that he seems to have done so with increasing uncertainty in this piece, combining it with a copyright logo that is echoed in the form of the open tin can above it. Some have suggested that Popeye's punch was intended as a sly response to one of the reigning ideas in contemporary art criticism that a picture's design should make an immediate visual impact. Whereas most believed this should be achieved with abstract art, Lichtenstein here demonstrated that one could achieve it just as well by borrowing from low culture. 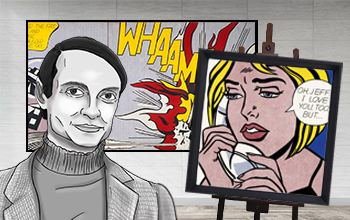 Artwork description & Analysis: In the early 1960s, Lichtenstein gained renown as a leading Pop artist for paintings sourced from comic books, specifically DC Comics. Although artists such as Robert Rauschenberg and Jasper Johns had previously integrated popular imagery into their works, no one hitherto had focused on cartoon imagery as exclusively as Lichtenstein. His work, along with that of Andy Warhol, heralded the beginning of the Pop art movement, and, essentially, the end of Abstract Expressionism as the dominant style. Lichtenstein did not simply copy comic pages directly, he employed a complex technique that involved cropping images to create entirely new, dramatic compositions, as in Drowning Girl, whose source image included the woman's boyfriend standing on a boat above her. Lichtenstein also condensed the text of the comic book panels, locating language as another, crucial visual element; re-appropriating this emblematic aspect of commercial art for his paintings further challenged existing views about definitions of "high" art. Artwork description & Analysis: Lichtenstein expanded his use of bold colors and Ben-Day dots beyond the figurative imagery of comic book pages, experimenting with a wide variety of materials; his landscape pictures are a particularly strong example of this interest. Lichtenstein made a number of collages and multi-media works that included motors, metal, and often a plastic paper called Rowlux that had a shimmery surface and suggested movement. By re-appropriating the traditional artistic motif of landscape and rendering it in his Pop idiom, Lichtenstein demonstrated his extensive knowledge of the history of art and suggested the proximity of high and low art forms. His interest in modern art also led Lichtenstein to create many works that directly referenced artists such as Cézanne, Picasso, and Matisse. Artwork description & Analysis: Lichtenstein was a prolific printmaker throughout his career, and his prints played a substantial role in establishing printmaking as a significant art form in the 1960s. Brushstrokes, one such print, reflects his interest in the importance of the brushstroke in Abstract Expressionism. Abstract Expressionist artists had made the brushstroke a vehicle to directly communicate feelings; Lichtenstein's brushstroke made a mockery of this aspiration, also suggesting that though Abstract Expressionists disdained commercialization, they were not immune to it - after all, many of their pictures were also created in series, using the same motifs again and again. Lichtenstein has said, "The real brushstrokes are just as pre-determined as the cartoon brushstrokes." Artwork description & Analysis: Lichtenstein was particularly fascinated by the abstract way in which cartoonists drew mirrors, using diagonal lines to denote a reflective surface. He once remarked, "Now, you see those lines and you know it means 'mirror,' even though there are obviously no such lines in reality. It's a convention that we unconsciously accept." The mirror was a recurring leitmotif for Lichtenstein during the 1970s, but the artist had experimented with the graphic representation of reflection in earlier works, driven in part by an interest in the relationship between women and mirrors - both in historical artworks and in contemporary culture. Although the series might have been inspired by the appearance of mirrors in cartoons, Lichtenstein clearly also wanted to engage with themes of reproduction and reflection, which have interested artists at least as far back as the Renaissance. Artwork description & Analysis: Public and outdoor artworks, both painting and sculpture, constitute a significant portion of Lichtenstein's work, starting with a mural painted for the 1964 World's Fair in Queens, New York. The large-scale sculpture House I plays with perspective and illusion: depending on where the viewer stands, he or she will see the building's corner appear to move forward or backward within space. Despite Lichtenstein's typical use of flat colors and the fact that this sculpture is really a flat piece of metal, the structure's design lends a sense of volume. He produced several House sculptures, all of which can be connected to Lichtenstein's interest in the interiors of buildings, a subject he visited most explicitly in his later work. Fabricated and painted aluminum, © Estate of Roy Lichtenstein - National Gallery of Art, Washington, D.C.
First published on 21 Jun 2010. Updated and modified regularly.